Turmeric, a spice with amazing health benefits! Turmeric has been found to have incredible health benefits for a multitude of conditions. It’s a very good, yet very safe, anti-inflammatory, owing much to the yellow-red pigment, curcumin. Effective for treating IBD, or Inflammatory Bowel Disease, it’s also very helpful with Rheumatoid Arthritis, and even Cystic Fibrosis. It’s a good antiseptic and antibacterial agent which can be used to treat cuts and burns. It’s also useful in treating psoriasis and other skin conditions. Recent studies concentrate on how it helps stall or reverse many types of cancer, and more pinpointed, how it actually inhibits cancer cell growth. In combination with onions, it’ been found to help fight colon cancer, too. Combined with cauliflower, it fights prostate cancer. It’s also been found to reduce the risk of childhood leukemia. Some are using it to help boost the effectiveness of chemo drugs. 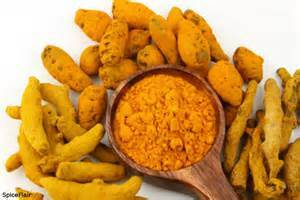 Research has also shown a dramatic improvement in liver function when turmeric is used. Cardiovascular health is improved by the use of turmeric, and it’s also a strong anti-oxidant, as well as helping keep cholesterol reduced by increasing mRNA which then reduces LDL by impressive amounts. Another very hopeful series of studies surround it’s use for treating or even preventing Alzheimer’s disease. Very strong evidence is being seen in using this very colorful herb to help our growing numbers of Alzheimer’s disease. WebMD lists the many uses as: “Turmeric is used for arthritis, heartburn (dyspepsia), stomach pain, diarrhea, intestinal gas, stomach bloating, loss of appetite, jaundice, liver problems and gallbladder disorders. Just what is Turmeric? It’s a simple plant, native to Indonesia and southern India and has been used in medicines for over 5000 years. It’s also used for fabric dying and while the color is beautiful on clothing, you probably want to avoid prolonged contact with your skin or objects you don’t want dyed; it will stain. How is Turmeric used? One of the most common uses of Turmeric is in curry dishes, where it’s peppery flavor enhances a range of foods. It’s also used in egg salad, deviled eggs, rice dishes, and is especially delicious when sprinkled on cauliflower prior to sautéing. Does Turmeric contain any nutrients? Turmeric is considered an excellent source of iron and manganese, and a good source of Vit B6, copper, potassium, and dietary fiber. Recipes? Of course! Here are three to get you started; we’ll add more shortly! Yellow Mustard – the Basic yellow mustard is a wonderful way to experience turmeric. This will take just a few minutes to prepare, but then it needs to rest for at least 24 hours, 48 is better, before using it. Whisk all ingredients, except vinegar, together until well blended. Bring to a boil over medium-high heat. Reduce heat to medium and continue cooking, stirring frequently, until thickened, about 10-15 minutes. Stir in vinegar and transfer to glass jars. Allow to cool to room temperature. Store in refrigerator for 1-2 days before using. (The flavor will be strong and bitter at first, but will greatly improve as it ages. Heat oil over medium high heat. Sautee onions and garlic until softened. Add carrots and cauliflower, sautee about 5 minutes. Add cumin, coriander and turmeric and mix well. Add remaining vegetables and continue cooking until vegetables are almost tender. Stir in the chick peas, coconut milk, soy sauce and curry paste. Combine well, cover, and continue cooking another 5 minutes, until vegetables are done and sauce begins to thicken. Serve over brown rice or in flat bread (chapattis). Serves 6. Note: This dish is quite colorful if you use baby spinach, green kale and red cabbage. You may also want to vary the vegetables according to what you have available. Mix all ingredients, except cauliflower, in a bowl and whisk well. Combine cauliflower pieces with oil mixture and coat well. Place in baking dish, sprinkle with salt, and bake for about 25 minutes, until fork tender. Serve hot.